When will this become HEADLINE NEWS? This needs to be front page of every news paper and top story on all news outlets! It’s nestled among the Redwoods in the woods of California. 2,700 acres of pristine land broken down into dozens of camps. And for two weeks every July since the 1880s, they have been filled with some of the most wealthy and powerful men in the world. While the US is struggling to find a solution on the debt ceiling, the country’s elite seems to be not so concerned. Some of American past Senators, artists and top business leaders are partying in the woods of California. 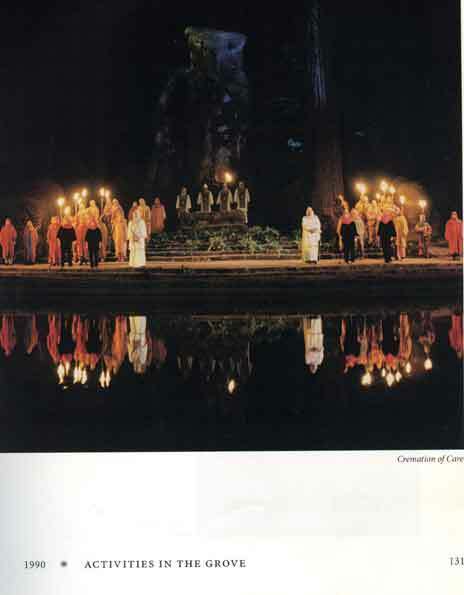 This top-secret gathering is called the Bohemian Grove and is none other than Bohemian Club’s exclusive playground. Given that the members are only men, and they supposedly perform some pretty weird rituals there, lots of rumors are spreading around about the society . All the information you need to know that their evil is basically the “Crimination Of Care”. The fact that they have a ritual where they are trying to take away all their cares and empathy should tell you that these people are evil. Any skeptic who doesnt believe they do evil things, should! believe when they know about the Crimination of care. Simple as.. Many researchers including Michael Tsarion, Chris Everard, and Freeman touch on the roots of owl symbolism and its links to Columbia. This goddess has been called many things, Isis, Ishtar, Athena, Black Madonna, and more. She is the goddess of death and war and for ages has been represented by the owl. There is a lot of info if you google or startpage it. “Our concern is not what’s going on inside the Grove, but what’s happening outside the Grove with the people that are in here,” Brian Romanoff, a picketer, tells The History Channel. “We’re all told that we elect representatives…they go to Washington, we have total influence of them and they make decisions that are in the best interests of us,” says Moore. “Crimination” of the care ? I have learned it is “Cremation of the care”. Anyway, from everything I have researched the past week on the internet, this ritual is truly satanic – with pedophilia and human (kids) sacrifices. The ceremony for the thousands of people on the weekend is fake. The real human sacrifices happen during the week with kidnapped kids, and are attended for very small selected groups. There are some videos on Youtube with David Icke where he describes it all in details. Some elite members taking part on the Cremation of the Care have also their own crematoria, in order to get rid of the corpses in all discretion. These evil elite controls the world, party and mock us – and we are just watching. Yes what fools we all are, try talking to people get them to wake up . it’s like hitting your head against the wall. most people are asleep and refuse to believe anything like this could happen. ( 6.000,000 jews dead, killed by this mindset of evil that is still around to this day ). Good families think their kids are safe from this evil, Think again. You will wake up one day but only when it is to late to do anything about it. I too have studied this group and tried to talk to people and get the same results. These thing seem so outrageous that people chuckle when you speak of it. I have tried warning of the One World Government and how this so called budget crisis is right in step with the One World Government. Formally known as the N.W.O. Yet no one believes it is happening as part of a plan. Well there is someone out there on the same wavelength as me. Thank God for that good on you americanbadass607 maybe we can find somemore people that are waking-up to what is going on and we can do something about it. Take care and keep looking over your shoulder. this has been going on for years…kids go missing all over the world…none of you freaking people do anything about it. See how the Yids are now protesting and it has become thee biggest problem to the Israel government. Even the Jews are waking up and setting up tent cities on Ratschild Blvd. I’m so sick of Americans complaining about their lame government and lameass dictator… take a lesson from the Israelis and go take-over your freaking state buildings at least. Here is the solution: every state needs to secede and ignore national protocol and policy. State armories need to issue all able citizens defence to defend state lines and all state and federal property seazed by the people. The russians and Chinamen are coming so forget this crap which is nothing but a distraction and face the reality which is right around the courner. And stop listening to Icke and Jones, they work for the tyrants, wake up! well if their were enough interested with the specialties required it would be nice to infiltrate at that time period in July and do some “cleaning up”. Just saying. I’ve been in BG during the encampment. Sorry to disappoint you, but it is a just a bunch of old guys getting drunk and throwing up all over each other. They kind of shoot themselves in the foot by holding the encampments behind ‘closed gates’ don’t they?